Carbon monoxide is a particularly dangerous gas as you can’t see, hear, smell or taste it – but it can be fatal. It is produced when fuels such as gas, oil, paraffin, charcoal, coal and wood do not burn correctly. So if there are any fuel-burning appliances where you are staying it’s important that these have been installed properly, are well maintained and are in good working order. Carbon monoxide can also build up when flues, chimneys or vents are blocked so these also need to be well maintained. 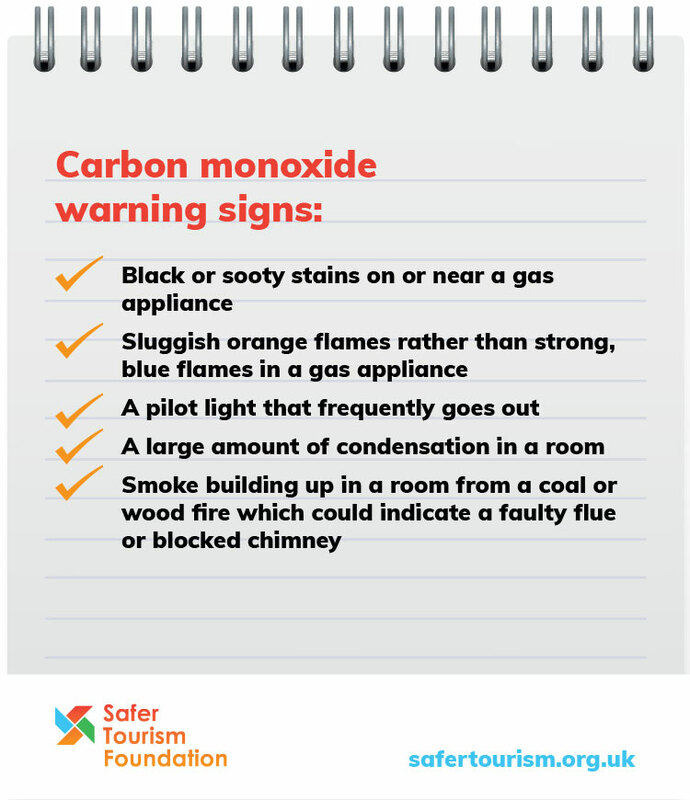 Appliances that can potentially produce carbon monoxide include boilers, cookers, gas fires, water heaters, camping stoves and open fires. In the UK carbon monoxide detectors are quite common but this is often not the case abroad. If you’re worried there may not be one where you’re staying you can buy a portable battery-operated carbon monoxide detector to take away with you for less than £15. Make sure the detector meets the British Standard EN50291. You can find a range of alarms available to purchase online, for example at Safelincs alarms. If you are concerned about any gas appliances where you are staying you should tell whoever is responsible for your accommodation immediately. This could be the owner, manager or reception of where you are staying or your tour operator. Eating different foods and being in a different climate can often take some adjusting to. But it’s important not to confuse holiday sicknesses such as food poisoning, dehydration or a hangover with carbon monoxide poisoning. Carbon monoxide poisoning can feel like flu but without the fever. The six main symptoms are headaches, dizziness, nausea, breathlessness, collapse and loss of consciousness. If you or anyone with you starts to show signs of carbon monoxide poisoning, you should go outside into the fresh air immediately. Next, seek medical attention and tell whoever treats you that you suspect carbon monoxide poisoning and ask for a proper diagnosis. 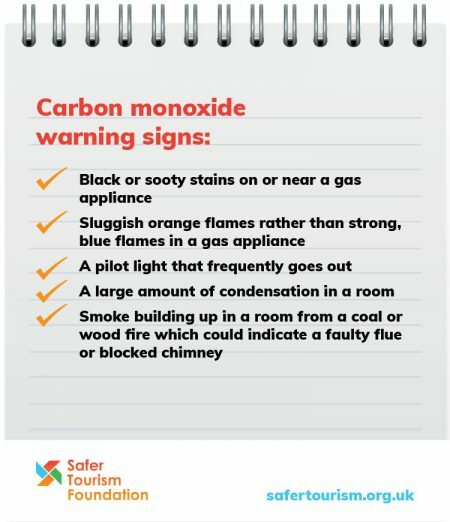 If your tests confirm carbon monoxide poisoning tell the people who are responsible for your accommodation straightaway. Extinguish all naked flames and don’t use matches or lighters. Don’t switch lights or any other electrical appliance on or off. If possible isolate the gas supply (i.e. turn off the supply using the tap on the bottle). Tell the people responsible for your accommodation about the smell.